It was one of the most beautiful spring days for this Carriage House at Pine Knob wedding. The day began in the most typical way, Alayna got ready at her parents house while Troy got ready at their house in Berkley. I captured Alayna’s precious moments in the morning while our executive photographer Lindsey, photographed the guys! And while the day seemed business as usual, it was filled with so much love, special traditions, laughter, tears, joy, and surprises that it turned out to be an amazingly spectacular day! After the getting ready moments, gift exchanges with family members, and tearful sentiments with parents, we were off in a hurry to the ceremony at St. Andrew Church in Rochester. The ceremony, one of my favorite moments to witness, included special Spanish traditions. It was a beautiful sight to see two families become one and different traditions blend together. And it wasn’t long before we headed off to The Mansion at Pine Knob to capture the bridal party with Alayna and Troy! The bridal party was an absolute hoot. They were a fun bunch of people who were having a blast with Alayna and Troy. 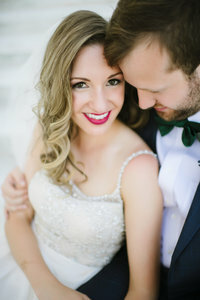 It was hilarious and enjoyable to document them all, but the true photography bliss came with the bride and groom. These two are absolutely adorable! Alayna and Troy are highschool sweethearts and the history shared between them gives them an obvious special bond. Documenting Alayna and Troy was like photographing my best friends. We laughed, joked, and talked together as I captured the beautiful and hilarious moments between them. But the hilarious and sentimental moments did not end there. We headed down to The Carriage House for their reception, where the guests mingled over cocktails. During the speeches, Alayna’s father had one of the most heartwarming and funniest speeches ever. And as Alayna and Troy cut their cake, proudly displayed on top was a cake topper with one of Troy’s most beloved cars… And there was a surprise musical moment when one of the groomsmen got up with the band and started playing the guitar and signing! It was so awesome! SO many phenomenal moments and pure emotions packed into one day. I’m sure they’ll be reliving it for years to come, but for now, take a peek and relive their day too.